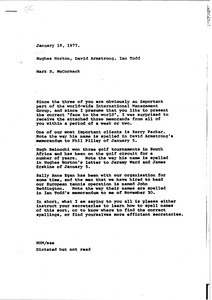 McCormack writes regarding special merchandising responsibilities for Rod Laver and Paul Warfield. 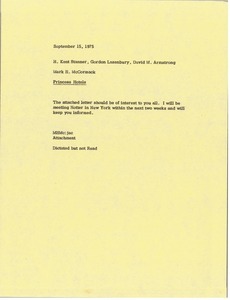 McCormack writes H. Kent Stanner, Gordon Lazenbury, and David M. Armstrong concerning Princess Hotels. 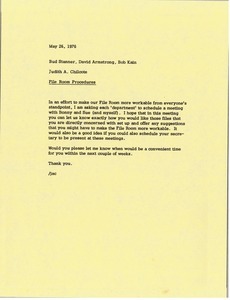 He indicates that the attached letter should be of interest to them and informs them that he will be meeting notter in New York within the next two weeks. Enclosure not with letter. 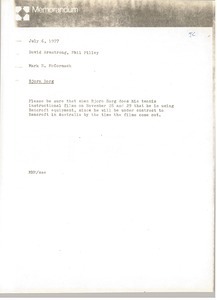 Requesting Bjorn Borg film a tennis instruction film with Bancroft equipment as he will have a contract with them in Australia when the films are released. 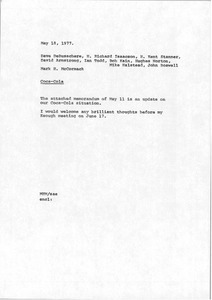 Enclosing an update to a Coca-Cola memorandum and requesting thoughts prior to a meeting. Enclosure not with memorandum. McCormack writes regarding sports marketing competitor, Bucky Woy, Spalding and World Championship Tennis. Enclosure not with letter. 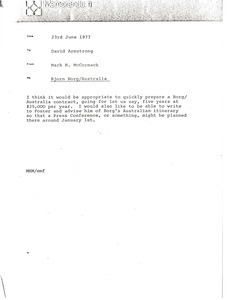 McCormack writes regarding a Bjorn Borg Australia contract. 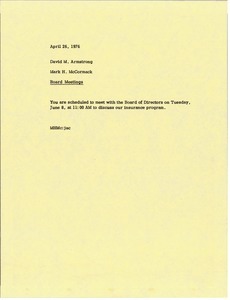 Informing Armstrong of a scheduled lunch with the board of directors to discuss the insurance program. 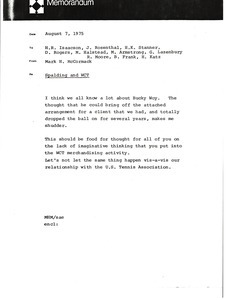 Concerning a Time magazine tennis outing. 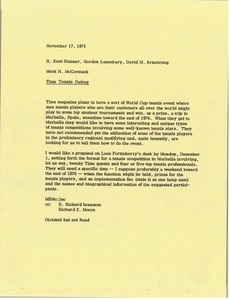 McCormack describes Time's hopes to have a World Cup tennis event for the male employees who play tennis and requests a proposal be sent to Lane Fortinberry. 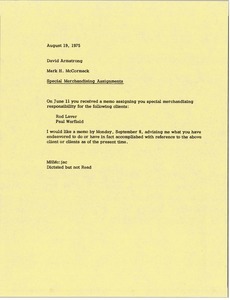 McCormack urges the group to instruct their secretaries to spell the names of important clients and staff correctly.